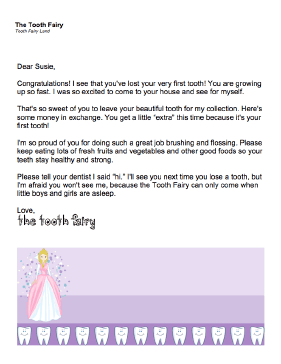 This printable letter from the Tooth Fairy is ideal for the occasion of a young child's first lost tooth. Congratulations! I see that you've lost your very first tooth! You are growing up so fast. I was so excited to come to your house and see for myself. That's so sweet of you to leave your beautiful tooth for my collection. Here's some money in exchange. You get a little "extra" this time because it's your first tooth! I'm so proud of you for doing such a great job brushing and flossing. Please keep eating lots of fresh fruits and vegetables and other good foods so your teeth stay healthy and strong. Please tell your dentist I said "hi." I'll see you next time you lose a tooth, but I'm afraid you won't see me, because the Tooth Fairy can only come when little boys and girls are asleep.